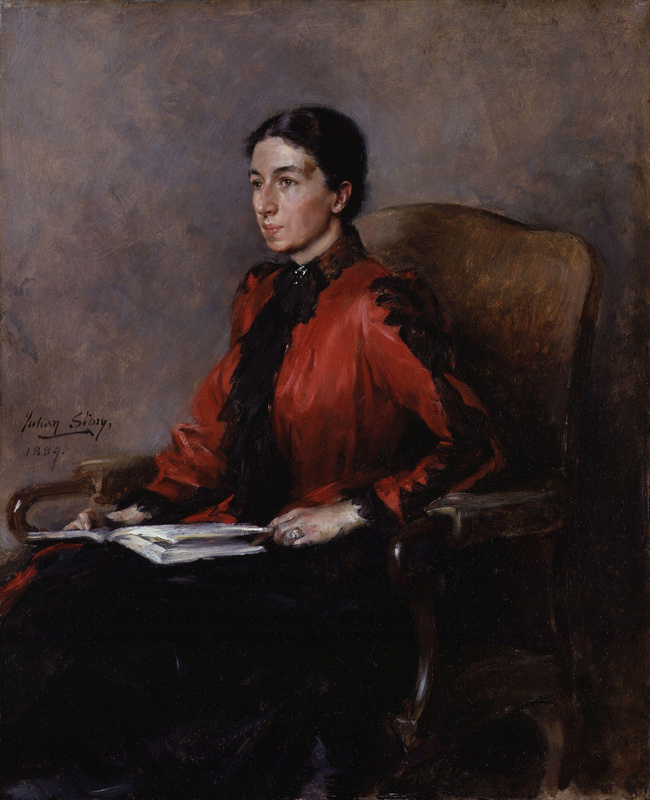 Mary Augusta Ward, by Julian Russell Story, 1889. National Portrait Gallery: NPG 2650. The Portrait of Mrs H. W.
Previously we had seen how Mrs Humphry Ward in her diary painted a picture of Oscar’s coat in the shape of a cello. And while it remains true that hers is the only description of the coat specifically in a “cello” shape, it turns out that she was not the only person to have noted Wilde at the Grosvenor, and other galleries, wearing a specially stylized coat of his own design. The key to finding these corroborating references lies in the timing of the occasion, and, again, Ellmann is responsible for initially misleading us. The problem is with the year 1877. 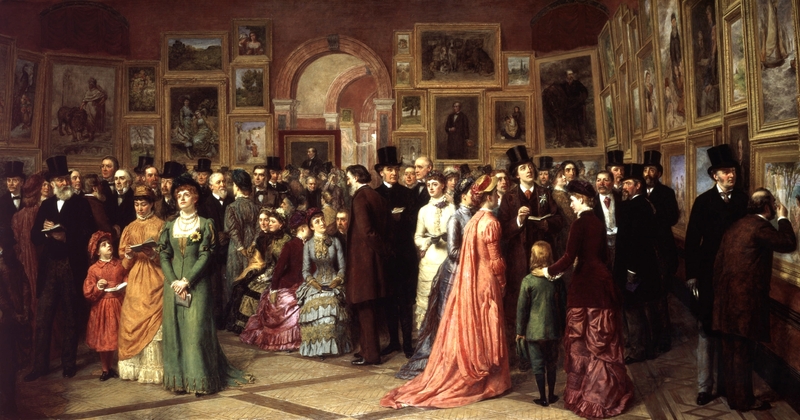 Ellmann says that the Grosvenor Gallery event (at which Oscar wore the coat) was the inauguration of the gallery in 1877— an idea he reinforces by referring to it as Oscar’s “London debut”. This is an understandable assumption given that Wilde was actually present. But he was present only as a rusticated Oxford undergraduate there to write a review for a college magazine. A little early one would think, even for Wilde, to be impacting the London fashion scene (his “dress” period was much later). And, if we recall that 1877 was three years before Polish actress Helen Mojeska famously expressed ignorance about who he was, and what he had done, it is unlikely that a society lady would be recording “the latest story” about him. The reality is that Wilde did not effectively come down from Oxford to London until early 1879. But what really makes the Ellmann date of 1877 suspicious is that Mrs Humphry Ward’s diary (Ellmann’s source for the story) is a record of the 1880s—according to the editor’s note the diary begins only in 1879. Further, the diary does not actually mention the inauguration, nor even an “opening” event: it merely refers to the occasion as a Private Viewing, of which there were many. Finally, while the published diary is arranged thematically, it is arranged within its themes chronologically, and the coat story is noted after the events of 1884. So if not 1877—when exactly? By examining the record we can eliminate many years of the 1880s when either Wilde or Mrs H. W. could not, or did not, attend the Grosvenor Gallery; indeed it necessarily makes sense to focus on the opportunities they had of attending together. From research it becomes clear that the occasion could not have been before 1885 nor after 1887. I will not detail the process of elimination here, because the following newspaper reports sufficiently identify the year. 1885 was a central year in Wilde’s advocacy of dress reform. Wilde’s subject matter was becoming increasingly practical, increasingly interior, and increasingly individual. It was as if he was turning the telescope around for a narrower view, one that would eventually focus on dress. In October 1884 Wilde gave his first lecture on “Dress” and by 1885 he had written his (recently discovered ) essay The Philosophy of Dress which he sent to the New York Tribune—where it was printed in April of that year. This was appropriate as it was around this time that Wilde would have had the coat made. It is possible that he did this in preparation for the London Art Season beginning in the last week of April, when private viewings and public openings occurred at all the famous galleries. So we conclude that Oscar Wilde’s cello coat debuted in the Spring of 1885. Reports soon gave a clue to how the fit of the coat had been produced. We see from this parody that the shape was achieved by inserting pleats into the back of the coat. The Latest Fashion. From 1885. By the 1888 season, when Oscar putatively gave up the life of a dandy for the steady job of editing Woman’s World, he also abandoned the cello. * I am grateful to Matthew Sturgis for his assistance and knowledge in the preparation of this article. Matthew is currently engaged on a major new biography of Wilde due for release in 2018. Oscar Wilde On Dress, John Cooper, CSM Press, 2013. Contains a detailed analysis of Wilde’s many dress influences, and Wilde’s essay The Philosophy of Dress in book form for the first time. Haweis (Mrs. H. R.), The Art of Dress. Illustrated. 1879. London. Chatto & Windus. The Bridport News, February 27, 1885, 3. ‘Our London Letter’ Northern Echo, May 2, 1885. Re: “brown”: cf. Mrs Humphry Ward’s description of “bronze”. “Madge” was C.E. Humphry, (Charlotte Eliza, née Graham). Reprinted in the Luton Times and Bedfordshire Advertiser, December 18, 1885, 9. “English Gossip”, London, May 11. Sydney Morning Herald,Â June 16, 1888, 6. Letter 1886. From “Wilde V. Whistler: Being an Acrimonious Correspondence on Art Between Oscar Wilde and James A. McNeill Whistler”. Privately printed, 1906 . Just been enjoying reading this on Facebook. Thank you, John. Dear John Wonderfully informative and entertaining. (And thanks for the name-check.) 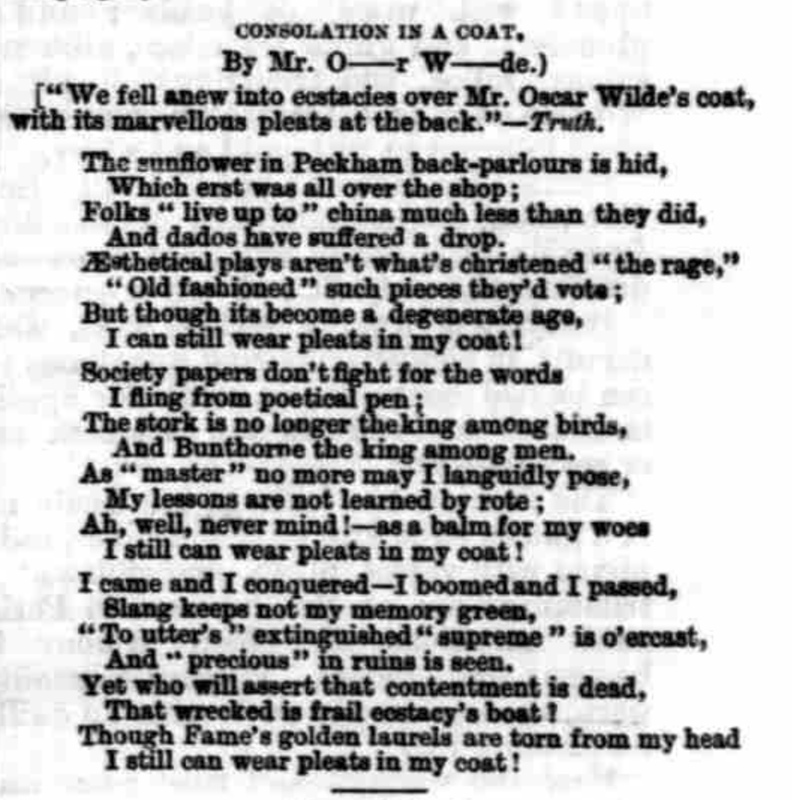 Am sure you are right that the Whistler quote alludes to This coat. The UCL Special Collections turn out to be housed at Kew, along with the National Archive. Rather a long trek. I will get there, but am not sure when. So the final footnote may have to wait a while…. Your research, deductions and conclusions took me from a fashionable fascination about a cello coat to being totally enthralled! I love your process for uncovering such mysteries. A fine piece of research. But I am intrigued by the coat OW wears in the Pennington portrait which is also distinctive, with its flared profile and velvet collar. This was gifted in 1884 but is said to date to 1881. Although Wilde starting writing about dress in the late 80s, I think he realized its potential much earlier. Hi Anne: Thank you for your reply and kind words. Just a couple of clarifications about dates. 1) I have my doubts about date of creation, and the date of the gift, for the Pennington portrait. I suspect both were later, possibly 1885. I am presently researching this. 2) But Wilde’s interest and writing about dress was, indeed, earlier than the late 80s. As I referenced in the piece, he began speaking about dress in 1882, and exclusively about it in 1884 which led to letters to the Pall Mall Gazette later that year and a full essay in 1885. Have you seen my letter in the Wildean re Frith requesting OW’s brown coat for the Private View ? Just read it yesterday!—my copy of The Wildean arrives a little later in the US. And I had you on my list of Oscaring to follow-up on. Celebrating Wilde tomorrow…wish me luck! I am the after lunch lecture…Wilde and du Maurier. Just finishing a paper for the Frith catalogue (2019) so brown coats are on my mind. Following up the claim that brown frock coats are aesthetic. Leighton seems to prefer them too. Congratulations for a fantastic piece of research. I was just wondering if you have a hypothesis about the identity of this fabric which sometimes looks bronze and sometimes red. Mrs. Humphry Ward’s comment immediately made me think of Solaro, or perhaps that tonic material that skinheads used to wear in the seventies. Just a thought. Hi José—thank you for your kind words. I am no expert on men’s dress materials of the 19th century, and I don;’t know Solaro. Alexander McQueen has an Oscar Wilde range of clothing with a coat made from wool doeskin?